Berlins very first and only shop for Bavarian Lederhosn and belongings for traditional Bavarian gear, used or new, just opened. Very well located, 5min walk-way from famous KaDeWe, West-Berlin, the little shop is easy reachable. Since 2009 the store becomes a popular meeting point for international lovers of Bavarian Lederhosn, handmade mostly. 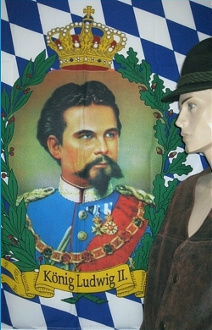 Bavarian hats, Wests, shoes and more give you the possibility to change into a real traditionally dressed person. 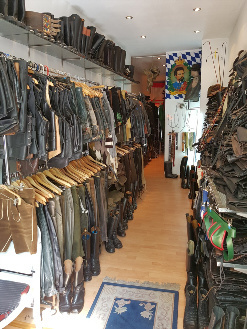 As well the shop offers a wide range on black leather, such as second hand motorcycle gear and fetish clothing. Heavy police- and military boots ("Knobelbecher"),and old but unused police- and motorbike-jackets Industrial rubber, Latex and craftsmen clothes complete the always changing collection. Mainly "second hand" the range of goods is as wide as from tradition to fetish. Located between Wittenbergplatz and Nollendorfplatz, both in Berlin Schoeneberg, the shop is located in the heart of Berlins gay community.